We know the advantages offered by not having to use a trailer and being able to store it in a closet or ship it on an airplane. What about the for real day to day? What about when it gets really muddy and you still have to pack it home? Do they really fit back in the bags they come with? Do most people deflate and pack them after every sail or do you end up leaving them inflated and using a trailer? With the boats having light and relatively high windage hulls, will they sit on the beach with the sails up without blowing over? I love my inflatable. It is a lot of fun to sail in any wind, I can do 5-6 knots of boat speed in as much wind. The boat is made to be forgiving, so while top speed is around 18 knots, you can sail in winds as high as 35 knots. The boat is confidence inspiring, I sail flat instead of flying a hull, even in those 35 knot winds. I have been out in wind gusts as high as 40 knots and I have not once dumped my boat. I also have the confidence that I can right my boat in less than 2 minutes, the boat only weighs 97 pounds, so I never feel overpowered or outweighed by the boat. I rinse the hulls in the surf, or I funded the kickstarter for RinseKit, which allows me to wash the boat down with fresh water before being packed into the bags. I pack them after every sail, the MiniCat 420 (the inflatable I sail most often) takes about 30 minutes to set up, and I can completely disassemble and pack it away in about 15 minutes. I would spend more time folding sails and stowing everything on my Pearson 26 when I owned a larger keel boat. I actually travel to most sailing spots via my 2014 Mitsubishi Mirage, I am not sure it is capable of towing an empty trailer. Most inflatable beach cats (even other brands than MiniCat) have roller furling jibs and it is very simple to drop the main. In higher wind days, I would not recommend leaving your boat with the main up, you will find it on its side when you come back. It's also nice to store them head to wind on the beach. The most common inflatables weigh less than 100 pounds, so turning them is quite trivial. If you drove by my house, you'd never know I owned 4 sailboats. I love being able to keep my sailboat out of the elements and out of sight. My name is Ivano Stellato. I've been sailing for over 12 years and before inflatables I sailed Albacore's, Lasers, A variety if Hobie's but mostly the Hobie 16, and on a couple of occasions a Nacra 500. I was lucky enough to sail with a 3 time Tornado Olympian who taught me a tonne and to whom I will forever be grateful and appreciative. I have also branched out into surfing, Wind Surfing and kiteboarding. I love sailing and i love design so a few years ago I started designing portable, inflatable sailboats -- I called it "Lego for adult water lovers" Then I found MiniCat and Tiwal and became their exclusive Canadian importer. I have a wealth of experience with inflatables and can share some of what I have learned..
haha, yes they do pack up into the same bags which is more than I can say for just about everything else in life. You get much better at assembly and packing with each time. The first time takes over an hour to assemble but by the fourth time you have it down to an art and it takes about the same time as rigging an Albacore from the sailing club i used to belong to. I always point the boat to wind and drop the main if I am on the beach for long periods or the winds are shifty but most of the time I leave it to flap away and only furl the jib. As a seasoned sailor I love sailing the inflatables! I furl the jib, , strap into the trapeze, Hike out and sail the main and tiller, then once thats under control I unfurl the jib... its full on intense action. I liken it to driving standard versus automatic. It just makes the whole experience that much more involved. And should I ever capsize I have no problem getting the boat upright and moving again. This lets me push the edge, catch waves, do things I normally would not do with other boats. Ive actually had horrible experiences with 3 people not being able to right a Hobie 16 and it just ruined sailing for a while for me. So having a boat thats so easy yet so engaging is really fun. Otherwise these bigger boats, without a motor boat nearby, if you get into trouble you really get into trouble. Also, the inflatables are super tough and easy to repair. Fibre glass is easy to damage and medium to repair. Root molded is super tough but impossible to repair. Inflatable are the best for that. Cost - if you don't own a cottage or farm where can you store a boat? You end up paying club fees or storage fees and in 10 years it equals the cost of a boat. I think inflatables make a great option for a wide range of uses. You can even put a motor on the transom! This is why I stated designing my own models and invested heavily in importing European models. I love all sailboats. If I won a Ferraro I would never say no to driving a Lamborghini. SO I think its great that there are lots of models and designs to choose from. So while i think One design is great from a racing purist, man to man, sailor to sailor, competition, I crave for open classes and the ability to tinker with a boat just like people tinker with cars and race them. Please let me know if you have any questions and Id be happy to answer ... or to take you out on an inflatable if anyone wants to try one out for themselves. Last edited by MysticPointSailR; 04/24/17 01:05 AM. 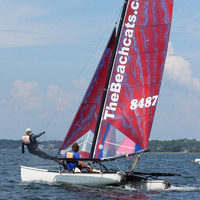 Most inflatable beach cats have roller furling jibs and it is very simple to drop the main. In higher wind days, I would not recommend leaving your boat with the main up, you will find it on its side when you come back. It's also nice to store them head to wind on the beach . The most common inflatables weigh less than 100 pounds, so turning them is quite trivial. Last edited by collidebluray; 08/17/17 11:03 PM. What inflatable to you have and what waters do you sail? Please introduce yourself. Great points... I love the fact that I can easily sail solo or maneuver the boats on land on my own ... I often prefer sailing on my own to get away from it all or if you cant find a sailing partner I like knowing I can handle everything on land on my own. Since I am a dealer I have sailed almost all the boats I carry ... not just inflatables but also car topable/portables like XCAT ... my usual waters are Lake Ontario, Lake Eerie, Lake SImcoe, Georgian Bay and Lake Huron ... we do get some big waves and winds but I usually don't sail above 20 knots anymore ... above 20 knots I prefer kiteboarding. We also get alot of low wind days so I like the boats with bigger sails such as the MiniCat 460 for the sub 10 knot days.